UPDATE: Motorola is getting their pico projector from Microvision, a TI competitor. 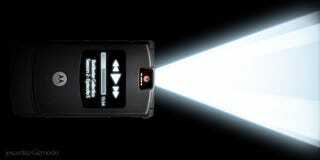 DLP® Products Shows New Developments in Pico-Projection Three manufacturers announce support for DLP powered projection in mobile devices DALLAS - October 3, 2007: DLP® Products from Texas Instruments (TI) (NYSE: TXN) today demonstrated the second-generation pico-projector prototype at the SID (Society for Information Display) Mobile Display Conference in San Diego. DLP Products announced that three technical manufacturers, Foxconn, Sypro Optics and Young Optics, plan to design and build mobile products that utilize DLP Product's pico-projection technology. DLP pico-projectors, either as standalone projectors or as integrated components in mobile devices, will provide consumers and business professionals with the flexibility to share video and graphic content in a larger way. Building on the DLP pico-projector first shown at CTIA in March, DLP Product's second-generation prototype demonstrates significant advancements in form factor and picture quality from the earlier model. The streamlined prototype is thinner and smaller, which allows easier integration in many mobile devices such as cellular phones, digital cameras and portable media players. DLP's latest prototype is in the form factor of a contemporary slim cell phone, measuring in at around 10 millimeters in thickness, with no fan or other moving parts. DLP has enhanced picture quality of its smallest projector, the pico, by incorporating the first ever speckle-free solution, which delivers a clear and crisp image using the same DLP display technology that consumers have come to know from DLP HDTVs and projectors. Products powered by DLP pico-projector technology, will enable viewers to watch pristine images and video clips on most surfaces with an image the size of a standard piece of paper (8.5 x 11 inches). "The DLP pico-projector technology has serious potential to redefine the mobile display viewing experience," said Frank J. Moizio, Manager of Emerging Markets Business, TI DLP Front Projection. "Today there are approximately 1.4 billion mobile devices with screens that are less than 3.5 inches; our innovation opens the opportunity to have information and video displayed in a much more compelling way - without compromise to the size of current mobile devices." Foxconn, Sypro Optics, and Young Optics bring years of world class manufacturing and innovative design expertise to this new mobile device projection market space. Working together with end product companies and brands, these manufacturers will make compelling integrated and standalone products that are truly mobile, a reality. "As a leader in the cell phone design industry, Foxconn is a keen judge of concepts that will elevate the market. DLP's pico-projector is highly innovative and will help us differentiate our design in the market," said Boris Hsieh, General Manager Digital Projection Business Unit, Foxconn. "We are bullish on our projections of the market opportunity for mobile devices that improve on the viewing experience. With help from DLP, Young Optics plans to deliver a superior mobile product design to the global market," said Claude Hsu, Executive Vice President, Young Optics. "We highly value the pico-projection innovation and foresee new revenue opportunities in the near future as a result of our product development with DLP," said Hans-Joachim Stohr, Director of Business Development and Sales, Sypro Optics GmbH. Key benefits of DLP projectors include: smoother images with no "screen door" effect; crisp and clear presentation of fast motion video; vibrant colors created by its BrilliantColor™ technology; and proven reliability across all facets - picture reliability over time (no fading, yellowing or color decay over time as compared to other display technologies), overall performance and dust-resistance. For more information on DLP and DLP products please visit www.dlp.com.